Christopher: Well, I know you well enough to know that when you say no to coffee, especially in the morning, all is not right in Whoville. One hard thing that comes up again and again in the Gilmore Girls series is the struggle to understand someone whose perspective differs markedly from one's own. Lorelai doesn’t understand her parents, and they don’t understand her. Sometimes Rory doesn’t understand Lorelai, and Lorelei doesn’t understand Rory. Also Luke can be confusing. And Kirk … forget about it. That it’s hard to understand differing viewpoints … well duh. Just because we’re sitting within arm’s length of each other doesn’t guarantee we’re having the same experience. I may be sitting at the seat with the view of the sea while you’re sitting at the seat with the view of the kitchen. When we’re having these vastly different experiences, it can be hard to remember to ask questions and to listen to the other person. It can be hard to see the other person as human. Our view of the world is based on empirical elements. It’s “factual,” you see. We just forget that our empirical reality is part of a larger collection of empirical realities that all together make up a whole. We forget about the “whole” part. What I love about Gilmore Girls is how it makes us confront the messy, complicated, sometimes upsetting, whole. It constantly challenges our understanding and judgment of characters, and invites us to do the same beyond the screen. In one early episode, Lorelei has an epic meltdown because Emily received Lorelai’s wedding news coldly. In the beginning, we might be on Lorelai’s “side.” We might be like, “[gasp] what is Emily's problem? !” Until we find out she heard the news about her daughter’s wedding from a stranger (Sookie). Emily may seem not to care, but in fact, she is deeply, desperately hurt. In another early episode, called “Christopher Returns,” Christopher’s father blames Lorelai for ruining his son’s life and mocks the life she has made for herself and “that girl,” meaning Rory. In the moment, Richard defends Lorelai, almost to the point of violence. Later, she approaches him to thank him for what she assumed was his protectiveness. But he reveals his motive was born from something different—sacrifice and loyalty. He sacrificed his own feelings about Lorelai’s choices out of loyalty to his blood, his family. Then Richard tells Lorelai that he and Emily didn’t deserve to have their daughter disappear from their lives. And he is right. Problem is, Lorelai is also right that she didn’t deserve to live a life of what was, for her, misery. So much of the series is these characters trying to see each other, to find their way back to each other, in spite of their different values and views of the world. If you’ve read Dr. Seuss’ “Horton Hears a Who,” you might see intersections: “Horton Hears a Who” tells the story of an elephant called Horton who discovers that what he thought was an insignificant speck of clover contains a vibrant tiny town, called Whoville. It has its own complex, if itty bitty, infrastructure invisible to Horton’s eyes. He can’t see it. It’s not his experience. But that doesn’t mean it’s not real. Except a know-it-all kangaroo hops over and decides Horton must be crazy. So the kangaroo spreads the word, and the jungle creatures gang up on Horton and his speck. Three monkeys grab the speck and pass it to an eagle, who flies it far away to a clover field, where it drops it among about a billion other specks. Determined Horton combs patiently through the clover field until he recovers it. At this point, the jungle creatures have just about had it with Horton. They tie him up, beat him, and tell him they’re going to drop the speck into a boiling vat of Beezle-Nut oil. They don’t see what Horton sees, so their response is to beat him and destroy what he is trying to protect. In desperation, Horton exhorts the tiny Whos to make as much noise as they can to prove their existence and save their world. The mayor of Whoville rounds everyone up (or so he thinks), and they’re still not loud enough. That’s when the mayor realizes one little shirker called Jo-Jo is messing around with a yo-yo when the town’s about to be boiled out of existence. Jo-Jo is brought to the town’s summit. He lets out a yelp. The jungle creatures hear it, and the town is saved. During World War II, Theodor Seuss Geisel, aka Dr. Seuss, was an editorial cartoonist for a New York newspaper. He produced hundreds of political cartoons in support of the war effort, which included supporting the internment of Japanese-Americans and creating racist caricatures in his comics. Eight years after the war ended, Geisel visited Japan and saw first hand the devastation the bombing of Hiroshima caused. 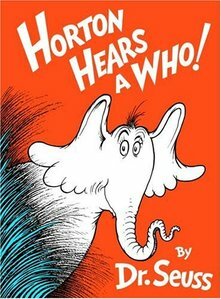 “Horton Hears a Who” was published in 1954, a year after Geisel’s visit. You already know to whom he dedicated the story. Knowing this brings new perspective to “Horton Hears a Who.” Especially to the moment after Horton recovers the speck, when the mayor of Whoville tells him, “When that black-bottomed birdie let go and we dropped, / We landed so hard that our clocks have all stopped. / Our tea-pots are broken. Our rocking-chairs smashed. / And our bicycle tires all blew up when we crashed.” Especially to Horton’s desperate cry to the Whos to raise up their voices and be heard. Especially to the mayor’s insistence that every last Whovian unite in a single purpose to prevent further destruction. In the grown-up land of the Gilmore Girls, uniting in a single purpose is harder than anyone would like it to be. Conflicting beliefs and desires crash into each other over and over again. The girls, and the people around them, have to keep on picking up the pieces and trying again. Like Horton. Like Horton's author. Like all of us.